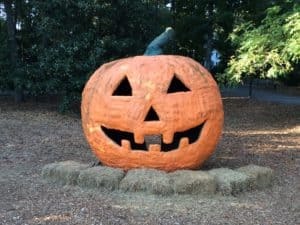 Autumn marks an exciting time in Roswell—Canton Street is magically transformed overnight and creative scarecrows line the sidewalks, the focus shifts to Ghost tours of historic Roswell monuments, and even hiking at Vickery Creek is more beautiful than ever, showcasing nature’s fiery palette of colors in the surrounding foliage. Roswell is certainly an attraction, and draws ITPers and OTPers alike to its main hub of Canton Street during the early days of Autumn. What’s not to love? Stroll down the wide and tree-lined sidewalks with family and friends and enjoy some local flavor. Stop in at Crazy Love coffee shop, and hang out on the sprawling lawn in the shop’s cozy Adirondack chairs with your favorite blend. Head down the street to shop, and pick up a homemade waffle cone full of small-batch ice cream or some homemade hot chocolate at Roswell’s newest sweet shop—Butter and Cream. If you’re looking for a fright, take a two-hour ghost tour around town! Stop by Roswell’s town hall parking lot on Saturday morning for an unforgettable Farmer’s and Artisan Market. Roswell even offers cooking classes at historic Barrington Hall! Even more community events can be found here. We’re falling hard for Roswell this Autumn… are you? Let The Peters Company help find you your perfect Roswell home!